The Dim Lights formed after our plumber figured we were bluegrass musicians and recommended us to the local Moose Lodge for a gig. Well, we got the gig, and her the ensuing years, we have been fortunate to perform at many other California venues and festivals including Vern’s Place at the CBA Father’s Day Festival in Grass Valley, the NCBS Good Old Fashioned Festival near Hollister, and the Kings River Bluegrass Festival near Fresno. 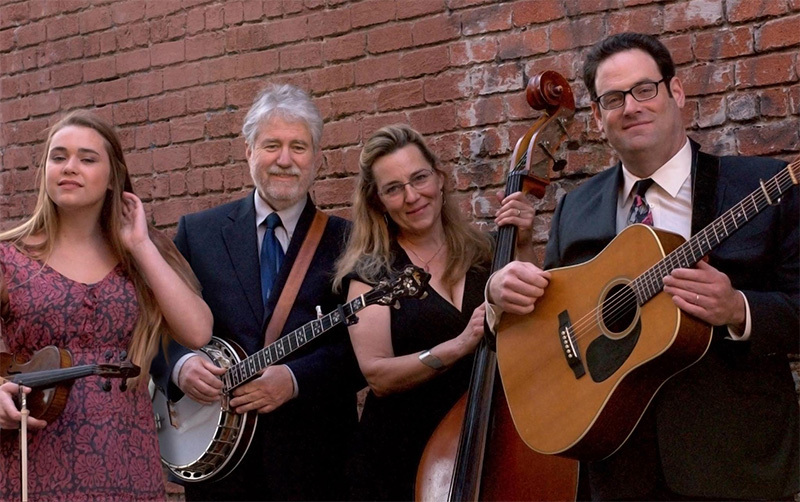 The Dim Lights are grounded in traditional bluegrass and anchored by the Frankel Family – daughter Dana on fiddle and vocals, mom Vicki on bass and vocals, and dad Avram on guitar and vocals. We are honored to have veterans Larry Cohea on banjo and Matt Kendall on mandolin, and particularly proud of how Larry and Dana ‘bridge the generations’. You’ve probably heard Vicki’s infectious laugh around a festival campground, or caught Larry, Avram or Matt up late picking or performing with other fine bands – but it’s Dana’s traditional fiddling and clear tenor that garner the compliments – she’s our star. We hope our performances reflect our love of bluegrass and attention to the tradition – and bring you back for another show. We’re brighter than you might think…!